Located in the heart of the booming RiNo Art District, there is a strip of greenspace under consideration as a new community gathering place that will attract locals & visitors in RiNo. The RiNo Park is located at 35th and Arkins and the RiNo Promenade is generally between 29th and 38th on Arkins Court. These are both special projects in collaboration with the RiNo Art District, RiNo BID, RiNo GID, Parks & Recreation and Arts & Venues. 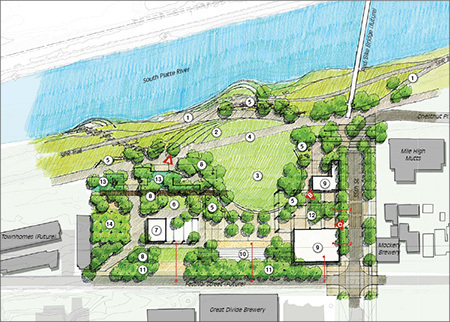 Planning is underway on the new RiNo Park. Over the past several years the RiNo Registered Neighborhood Organization and residents have been very involved in creating a destination park at 35th and Arkins. This park will serve as a community hub that celebrates art, innovation with water quality and community activation for not only RiNo but the surrounding neighborhoods of Globeville, Cole, Five Points and Elyria-Swansea. Additional planning is also underway between 29th and 38th on Arkins Court for additional greenspace and activation that will compliment the RiNo Park and neighborhood connections. The RiNo Gee Sway is a grass-roots organization that is focusing on this area of the South Platte River. Gee Sway organizers are passionate about the river's health as well as the wild life that frequent this area. Geese migrate to this area all year long with massive numbers arriving each evening at sunset in the Fall and Winter months. For more information please visit the Gee Sway web site.